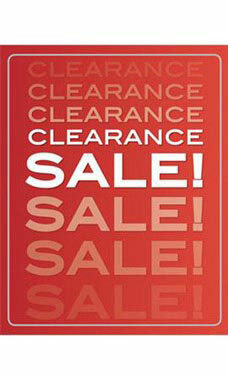 Get customers into your store by attracting the right kind of attention with our Clearance Sale Poster. The heavy weight glossy poster features bright white lettering on rich red background. Bold white on red spells out the word CLEARANCE SALE! in all caps. Sale posters are sold in pairs. Each one is 22”W x 28”H. The posters can be mounted onto any flat surface or placed into one of our twin stem bulletin sign holder (22108).